Beating out its main European competitor Airbus, Boeing has secured the first oversea sale of its new KC-46 Pegasus tanker aircraft Kyodo News reports. Japan, according to media reports, will procure three KC-46 Pegasus tanker aircraft by 2020 at an estimated price of about 20.8 billion yen ($172.8 million) per plane. Tokyo has set aside funds for the procurement of the planes in its fiscal year 2016 defense budget. A final contract is likely to be signed in early 2016. Overall, Japan’s Ministry of Defense (MOD) is requesting a 5.09 trillion yen ($42.38 billion) defense budget for fiscal year 2016, up 2.2 percent from the current fiscal year. One of the reasons why the KC-46 Pegasus was selected over a tanker offered by Airbus, based on its A330 commercial jet, is easier interoperability with U.S. aircraft, according to MOD officials. It is also ideally suited to refuel Japan’s future fleet of Bell-Boeing MV-22 Osprey aircraft – a hybrid between a conventional helicopter and turboprop plane (See: “Meet Japan’s Newest Aircraft for Defending the Senkaku Islands”). The KC-46 Pegasus conducted its first maiden flight on September 25 at Paine Field in Washington. Boeing’s tanker program has been plagued by delays and cost overruns. The plane is an improved variant of the Boeing KC-767 air tankers, four of which are currently in service with the Japan Air Self-Defense Force (JASDF). 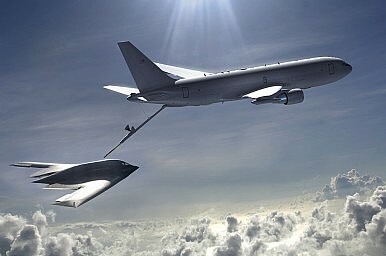 “We look forward to working alongside the US government to help Japan expand its aerial refuelling capabilities with Boeing’s next-generation KC-46 tanker,” according to a Boeing statement. According to the Boeing website, the KC-46 Pegasus is a multirole tanker, compatible with international aerial refueling procedures, and designed to “detect, avoid, defeat and survive threats using multiple layers of protection, which will enable it to operate safely in medium-threat environments.” It can carry up to 212,000 pounds (96,000 kilograms) of fuel. The United States Air Force (USAF) is planning to induct a total of 179 KC-46 planes by 2027. So far, Boeing has built four prototypes, which form the 418th Flight Test Squadron, Detachment 1, according to IHS Jane’s Defence Weekly. The first 18 combat-ready KC-46 tankers are slated to enter service with the USAF by the end of 2017. Japan Air Self Defense Force Stands Up First F-35A Lightning II Fighter SquadronUS State Department Approves $2.15 Billion Aegis Ashore Sale to JapanUS Defense Firm Boeing Receives $2.4 Billion P-8A Poseidon Contract From US NavyJapan Mulls Ceasing In-Country Assembly of F-35 Fighter JetsAre 105 Extra F-35s the Best Option for Japan's Military?